Good news - we updated AdventureQuest:Dragons on Google Play and the iOS app store! Why did you have to update? One of the biggest challenges about creating and maintaining mobile games is the way the app stores and software developers are also required to update and maintain their products. That can lead to version conflicts which require updating different components of a game or, like with the most recent changes to AQ:Dragons, significantly overhauling parts of it. 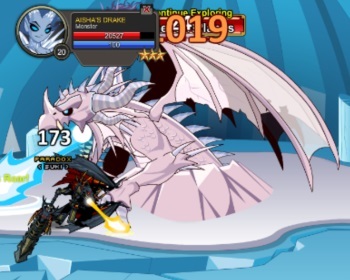 BUT on the plus side, if you didn't have a device which could run AQ:Dragons, you'll be able to unlock the Flame Dragon Warrior set in AQW! 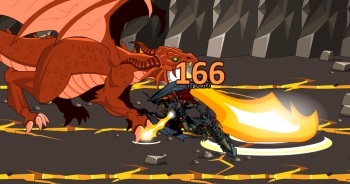 * As of today, buying the AQW Flame Dragon Warrior package will unlock a unique character page badge. AQ:Dragon Founders will get to keep their exclusive character page badge AND unlock the new badge for free. 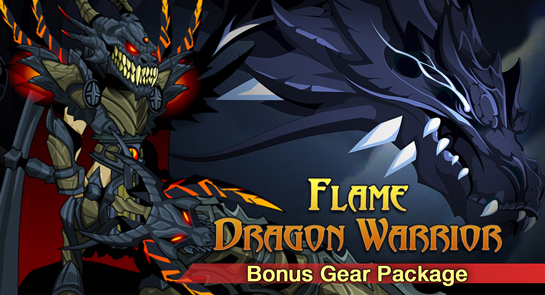 Buying the Flame Dragon Warrior set unlocks the full armor set PLUS the Flame Dragon Warrior CLASS! After purchase, check your Book of Lore for the link to the shop to get the gear. The Flame Dragon Warrior is a VERY powerful class with a skillset that's extremely useful for either boss fights (like taking down dragons), pvp (slaying DragonSlayers) or just everyday use farming (in the Dragon's Lair) . Auto Attack: Pretty basic. 2 second cooldown. You need to be able to swing around your weapon somehow. Blast 3 targets with flame to deal fire damage. Builds stacks of Dragon's Roar which affects other abilities. Akriloth grants you the power to do a 400% DoT for 10 seconds, with a 25% chance to stun your opponents for 6 seconds with Smothering Smoke, Stacks of Dragon's Roar increase damage. Yes, all those words and numbers are correct. 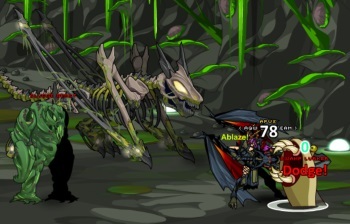 You can get an extremely high DoT AND do a pretty nifty amount of damage too and even a good chance for stuns. This skill is really good for beating down something (or someone) really quick without hassle. Note: The DoT CAN be applied even without stacks of Dragon's Roar, BUT YOU WILL NEED THE STACKS if you wish to do damage as well. A Moderate Damage Skill. Applies Ablaze which increases Strength by 25% for 8 seconds. If stacks of Dragon's Roar are present, removes all stacks of Dragon's Roar and applies Extra Defense which reduces all damage taken by 40% for 15 seconds. Feeling a tad too squishy? Want to buff yourself up like a (small) tank? With stacks of Dragon's Roar, your defense power grows AS WELL as your strength! It's a GREAT thing if you want to survive a few more hits and make sure you can take your opponant down. Goes great with a healer. The magic of dragon scales gives you 30% spell resistance. Neat little passives. Helps you survive more. Not much to say about it. DESTROY with the power of your rage and damage! Also applies a 350% DoT over 8 seconds. Double the DoTs, double the fun! The fun WILL be doubled with this skill! This is your boomshot, the skill you *wisely* use as you don't wanna waste your mana compltely (I'm bad with mana at times...) Anyways, as well as getting a decent strike off, you also get another DoT just to be more of a bother. Works quite nicely with Dragon's Strength. Do you like your DoTs? Of course you do. Do you want to make them even better? OF COURSE YOU DO! Similar to Dragon Shinobi's Rank 10 passive, Dragon's Burn will give your DoTs even BIGGER damage ranges! it's a PERMANENT increase! Overall, you can survive pretty well with the class. Your power can be used for high damage and DoT or tank it out, taking hits from everything that decides to come your way.